Besides this fact that your needs are ceaseless and you can’t achieve all of them but yes you can try to fetch them gradually. You will concur with the fact not all, but many of the desires are common and irreplaceable and out of them “Buying the Best Home Space” is the foremost desire and if you do not have your dream home your life is completely boring because home is not just an address, but it also symbolizes your taste, level and position, so it should always be perfect. Besides this, there is one fact and that is an investment in property is not a piece of cake, but yes it is not daunting as well and all you need is a meticulous attention so that you hit the best and secure home option for your investment. As you are clear about the fact that here in this blog we will get to know about the latest residential properties in sector 33 Sohna Gurgaon (also known as South of Gurgaon). But before this, it is important to educate yourself a little, so that you never place any fault because if it is not done rightly, then for sure investment can be a fiasco and you never want that, m I right? Always pay attention to the builder and check their history because if you will ignore the builder you may trap in a wrong situation, so always check their projects and get a good idea. Location actually decides the value of the property and in addition to this, a good location means a better connectivity, so when you keep property ensure that it is connected to all social infrastructures so that it curtails the distance and let you travel smoothly. Check the project completely- what is there to check? Space should be enough, it should have all modern amenities to give a different experience, make sure a good security system is there to make you feel secure, proper roads should be there outside the project, so that you can commute easily and it gives you some satisfaction, possession is important, so ask it before and try to compare the price because if you can get another property at the same price, then it is better to choose another property. So these are few points to Keep in Mind Before Investing in any Property. 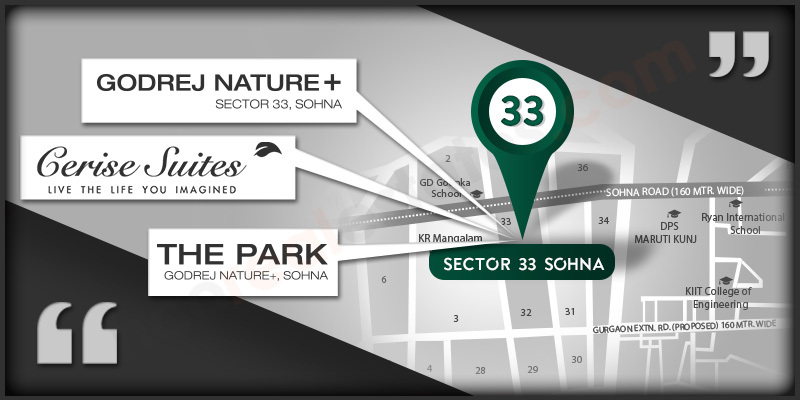 I think now you are educated enough to choose the best, so here we will talk about the Latest properties in Sohna sector 33. The name itself success you clearly, the USP of this project is its greenery that gives you new nature with luxury and here green zone adds pure air quality where every resident will imbibe a fresh air. Interestingly, green properties are far more in demand because of the awful air quality. So Godrej Nature Plus project is a perfect combination of ample nature, captivating designs, lush modern amenities and more and when you get these perks at your own home you feel completely happy. Here you get the combination of 2 BHK and 3 BHK apartments and each of them is intended to bring a high level living space for those whose desire is completely matchless and kudos to the builder Godrej Properties who really thought of such masterpiece in order to unlock the modern life that is much required nowadays. Here as far as the security system is concerned you get high tech security system with Patrolling, dog patrolling, bus shuttle service, etc option and this clearly means that every family here will feel secure. What modern home address looks like you will see exactly the same here. So clearly a heaven in Sohna waiting for your presence and to let you book a promising address for secure investment where return over investment is completely impressive. One the second number we have Godrej The Park project and importantly, this project is the part of Nature Plus Sohna and the Godrej Properties launching its two projects in different towers, so now you are clear about the first one, and here let us talk about the second one, Godrej The Park, Sohna this project is a perfect blend of 2 BHK, 2 BHK+ Private Deck & 3 BHK and each of these units are planned with perfection to meet the high level requirements, so that the residents get their right address that never fails to deliver its quality life. Godrej Properties holds innovative and being a part of their family always means that you are living in the best world that never fails to deliver your dream home because according to them anyone can present a home, but conceptualizing a home that ideally fits in the modern requirement is a challenge and they have taken this challenge in the best way possible and I think that is why they have given such beautiful addresses in the market and that doles out happiness and satisfaction altogether. As far as the amenities are concerned, you get the same like the above one. You know this or not, but serviced apartments are more in demand and the biggest reason behind it is that it is a mini investment and high in demand, so it is obvious, then something is in demand it has great value, so logically, it is good to invest in something that is lucrative. 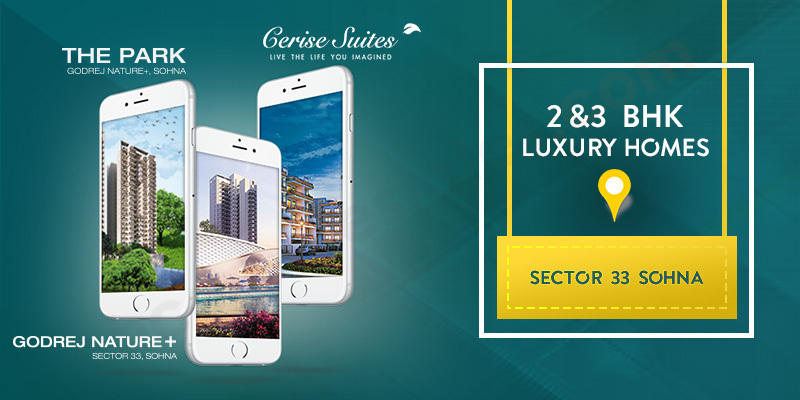 So, Central Park 3 Cerise Suites embraces a mesmerizing blend of luxury & peace where every corner turns up a life of perfection and satisfaction. Here you get 2 BHK unit that this apartment gives you a compelling view that put you in some trance from where you never want to come out. This project is a part of Central Park Flower Valley Township that is scattered over 180 areas and this gives you perfect picture and address to lock yourself every day. Most importantly, Aquatic gym, café, gazebos, restaurants, club – house and more are the major options that add freedom to pick any service, I think now there is no need to go outside for your fun because when everything planned rightly for you at the same place, then there is no need to waste your time in your travelling. For this great planning in Sohna Central Park builder deserves a good amount of respect because this will motivate them to bring more such projects in the market so that everyone can move towards the better side of development, so that a change and bring a sea change in the real estate market. As you know today’s homes are completely different the way it was before and now it combines many things together so that the residents get the home address they always to be in. Lastly, if these properties are in sector 33, Sohna and this sector directly connect to Sohna Road where further SPR roads open up a way to connect ahead. Reputed schools GD Goenka, DPS, Ryan International school and options available, best hospitals in the circle, biggest Huda City Centre at a good distance, NH-8 further connects to Gurgaon and Delhi and of course to IGI Airport. So all in all, Sohna is the next leading hub that form international level zone where all the builders will come in order to bring a next level home space and its well planned social infrastructure piques the day to day lifestyle and even your kids will have all the option in the vicinity, when you live in a location that connects you it makes you a smart commuter and even save your good time. You have a great time and lucrative options your investment blends in the best way possible, but I will suggest you do not take too much of time in thinking because this way you may miss out these projects and you never want that because a smart decision doesn’t take much time to born.